Nice capture of the angles, curves, and colour! Interesting use of harsh light. I'm not sure I like the dark shadows, but they are a part of the shot - I wish the license plate wasn't cut off too. I'd have steered away from leaving the license plate in the frame. Cool car though in what appears to be immaculate condition. The license plate also disrupts the flow of the picture too. Interesting, but confusing - I'm not sure which bit I'm supposed to be looking at. Wow, I really like the tone of the picture, which I think was created by the extreme angle of the sun. You must have gone crazy trying to decide how to crop this one! :D Good job. Like the framing. Beautiful rich tones. Neither overly sharp or too soft. Exposure is perfect. You should do well with this. One of the best car shots I've seen here - and great light. Those details are actually useful - in that they're some of the defining styling of that car. Great work. Was this taken in the late evening? The light creates a cool effect and makes the shadows very long. This is my favourite time of the day. I like this photo. Wonderful shot! This is my favorite, so far. I love the shadows and the colors. Perfect cropping! 10!! Nice, clean shot, good angle, my husband really likes this picture! Nice light control, good clean shot. always a photogenic subject. 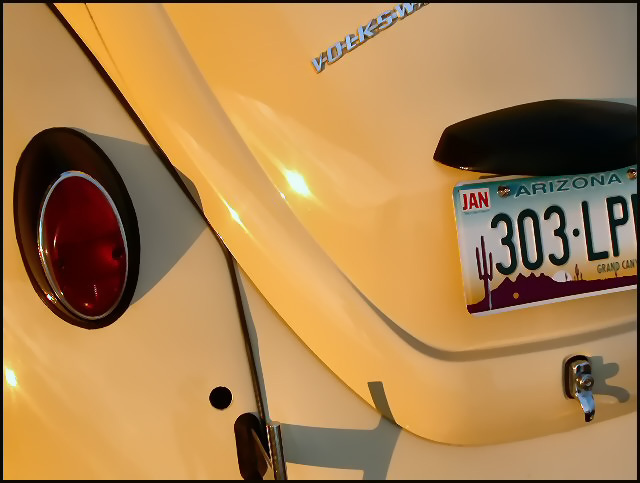 Nice lighting.. almost goes with the AZ sunset on the plate? NIce comp. Composition: May have tried to use the ROT's a little more, although I appreciate the parts are a little far apart. Technical: Nice contrast and lighting. Interesting shadows too. Around the bumper and numberplate it looks stepped - poor resize? Overall impression: It's rare for car shots to look nice, but this is a good example. Let down slightly technically, but otherwise spot on for me. Proudly hosted by Sargasso Networks. Current Server Time: 04/22/2019 04:46:29 PM EDT.